Enjoying a cup of tea by yourself? 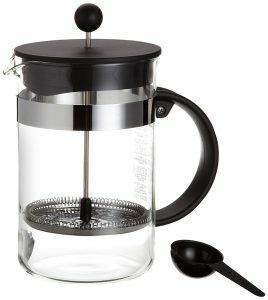 Consider these infusers. A tea ball, like this stainless steal one from Stash Tea, is exactly what it sounds like: a perforated ball into which you place loose leaf tea, often accompanied by a chain. Pull the chain to remove the ball once your tea’s steeped and you’re ready to enjoy. At 2 inches wide, tea balls like this one are great for individual cups of tea. 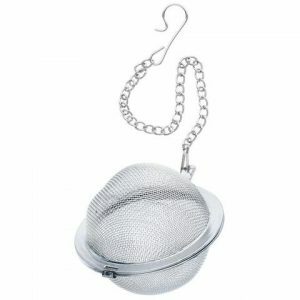 An infuser basket, like this one from Rishi Tea, is another great single-cup solution. Infuser baskets provide more depth than tea balls, giving your tea leaves more room to expand and unleash all their flavor. This particular infuser basket contains a top that can double as a coaster for your tea basket, eliminating mess. For a sleek and skinny infuser option, choose a tea stick like this one from Pinky Up. 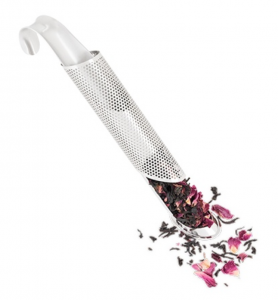 The stick format provides an easy way to stir, as it’s basically a spoon and infuser in one. If you’re brewing for a group, try one of these higher-volume options. A gaiwan is a traditional Chinese bowl with a lid that is used to prepare tea. Simply put your tea leaves inside the bowl and add hot water. When you’re ready to pour the tea into individual cups, use the lid as a barrier between the leaves and the cup. Buy a large gaiwan like this one from The Tao of Tea to serve a group. 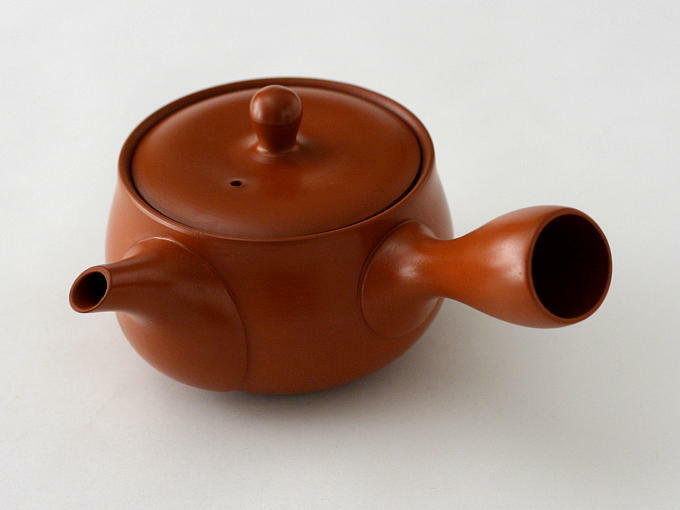 A kyusu is a traditional ceramic Japanese teapot. Many kususus on the market today include a mesh filter at the base of the spout, preventing any leaves from falling into your cup as you pour. This kyusu from Hibiki-An holds about 13 ounces and is perfect for a small tea party of 3 people. 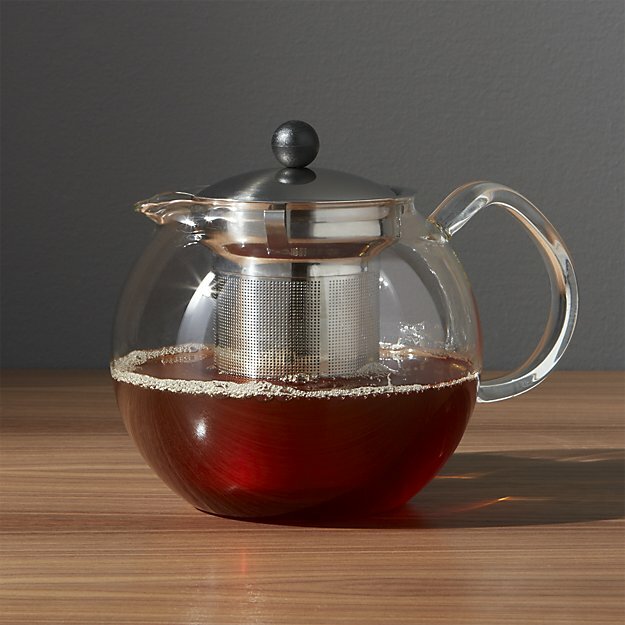 Some teapots come with infusers so that you can easily brew tea for a large group, like this one from Crate & Barrel. Put your tea leaves into the infuser, add boiling water, and watch through the clear glass as your tea’s flavor and color seeps into the body of the teapot. Open your cabinet and pull out a 1-square foot sheet of tin foil to make this infuser. Fold the tin foil twice, then pour tea leaves in the center. Pinch the corners above the leaves to create a little ball around the leaves. You’ll have some tin foil left over, which will function as a handle. Poke 10-12 holes in the ball, and you’re ready to put this bad boy in a hot cup of water. If you have a cheesecloth, you can easily prepare loose leaf tea, as described by Save Spend Splurge. Simply place your cheesecloth over a mug, and top it with your tea leaves and hot water. The flavors of the tea will seep through the cheesecloth while the leaves themselves remain on the cloth. Once the tea’s steeped, you can also squeeze the cloth to add every last drop of flavor to your tea.